Our EzFlow Competitors White Powder (1oz) is a formula which has a slightly faster set time than the A Polymer series with the same durability. 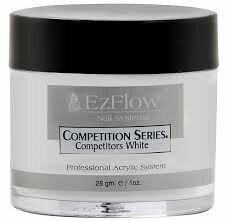 EzFlow's competition series is used by many of the world's top nail competitor. This pure, non-fade consistent colour is fast drying to give smooth texture with no bubbles.